Roller conveyors can be unpowered, often referred to as gravity roller conveyors, or powered. They can range in length from one to hundreds or even thousands, of feet. Typical widths run from 6” or so to 6’ or more. Belt drive – A powered belt is mounted under the rollers running opposite to product flow. Friction between the belt and rollers causes them to turn, conveying the product. Slippage between belt and roller assures minimal back pressure. Even more precise backpressure control can be achieved by dropping sections of the belt out of contact with the rollers. Chain drive – Each roller has a pair of sprockets on its axle. Sprockets are connected by short loops of roller chain. A motor drives one of the sprockets and the chain loops drive the rest. Line shaft – A powered shaft runs the length of the conveyor. A rubber belt, twisted 90 degrees, connects the shaft to each roller. Each roller is normally driven but this is not necessary. If there is too much back pressure belts can be removes so that only a portion of the rollers are powered with the others freewheeling. Motorized rollers – Several companies manufacture rollers that incorporate an electric motor in the roller. Roller conveyors work best on larger packages such as cases, pails, drums, pallets. Smaller packages such as bottles will jostle as they move from roller to roller due to the uneven surface. The rule of thumb is that there must be at least 3 rollers at all times under the object being conveyed. The three roller rule also applies, loosely, to objects having irregular running surfaces. The rollers must be set closely enough that protuberances, such as a slat on the bottom of a pallet, do not get caught between rollers. Alba, pallet transfer conveyor. 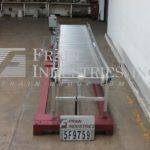 Equipped with a 52" wide x 60" long roller bed with (3) pneumatic lift cross direction chain conveyors. Designed to advace pallet at 90° of infeed position. 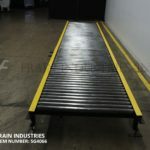 Orion, 52" Wide x 25′ Long, powered pallet roller conveyor. Powered by (3) ½ Hp motors. Equipped with 2½" diameter rollers on 4" centers, 1½" gaps and a 15" – 20" high infeed / discharge range. 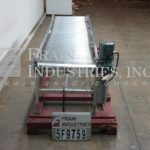 184" Long x 30" Wide stainless steel, fixed roller conveyor. Equipped with 1/3 hp motor with start / stop push button controls, 1/8" rods on 3/4" centers, discharge height of 32" and mounted on stainless steel base frame with 4 height adjustable legs. 72" Diameter, 58" wide, 90° rotary pallet conveyor. Equipped with 2-1/2" diameter rollers, 3" centers, 1/2" spacing between rollers, 17" infeed/discharge height, photo eye sensors, and (2) 1hp drives.